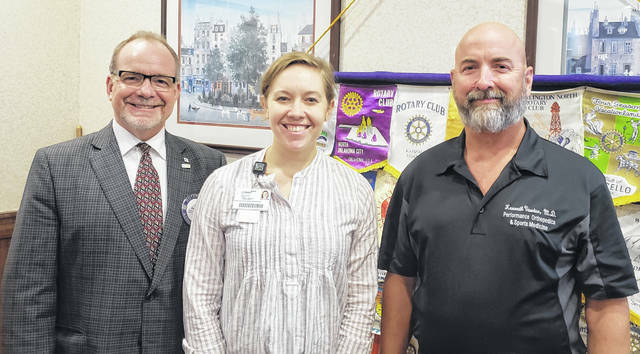 From left are: Dan Evers, President of the Wilmington Rotary Club; Kelsey Swindler, Marketing and Communications Coordinator at Clinton Memorial Hospital; and Dr. Ken Vawter, Orthopedic Surgeon with Performance Orthopedics and Sports Medicine. WILMINGTON — Dr. Ken Vawter of Performance Orthopedics and Sports Medicine recently spoke to the Wilmington Rotary Club which meets at noon at Damon’s Restaurant. Dr. Vawter received his Doctor of Medicine degree from the Uniformed Services University of the Health Sciences in Bethesda, Maryland. He completed a general surgery internship and his orthopedic surgery residency at Wilford Hall Medical Center in San Antonio, Texas (now known as San Antonio Military Medical Consortium). Dr. Vawter served as a Lieutenant Colonel (retired as of Aug. 1) in the U.S. Air Force and General Orthopedic Surgeon at Wright-Patterson Air Force Base, providing care for active-duty service members, dependents, and retirees since 2012. Dr. Vawter provides comprehensive orthopedic care in fracture management, joint replacement, minimally invasive arthroscopy procedures, and a vast array of soft tissue procedures. While in the Air Force, Dr. Vawter was a flight surgeon — physicians who serve as the primary care physicians for a variety of military aviation personnel on special-duty status. Flight medicine is essentially a form of occupational medicine and flight surgeons are tasked with the responsibility of maintaining the military’s strict medical standards, especially the even stricter standards that apply to those on flying, controlling or jump (airborne) status. Dr. Vawter is now taking patients and is pleased to provide orthopedic care to the Clinton County/Wilmington area.